Like most game news sites, we receive emails on a daily basis from groups or individuals wanting to submit their games for review. Most of the time these are blanket emails sent to various sites at once or simply generic messages, whereas occasionally they are targeted directly at us due to our focus on 'retro' games. 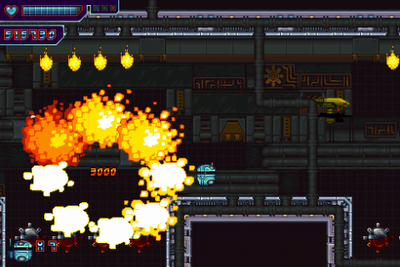 Indie developers, please take note; RobotRiot is exactly the kind of game that ticks all the right boxes at RGCD HQ. 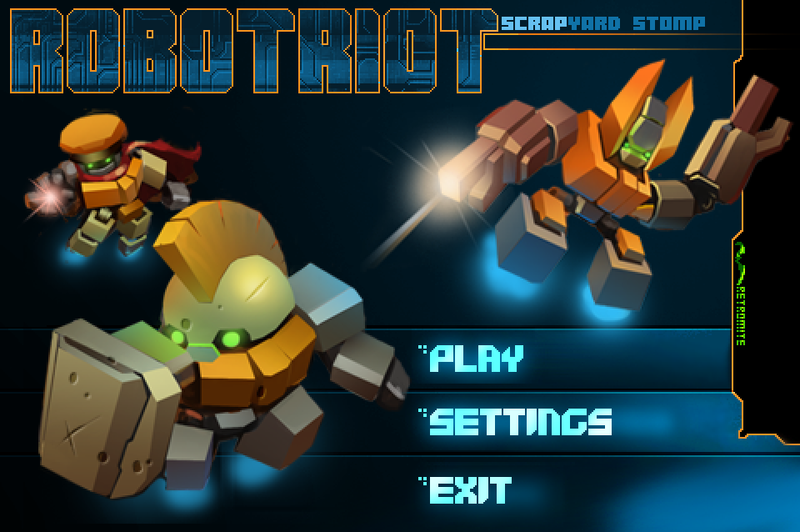 After recently acquiring an iPhone through work, my initial discovery of RobotRiot was a happy accident via iTunes - an accident that became considerably happier-still when I stumbled upon the PC/Mac version on Desura after googling for more information on the developers, Retromite. 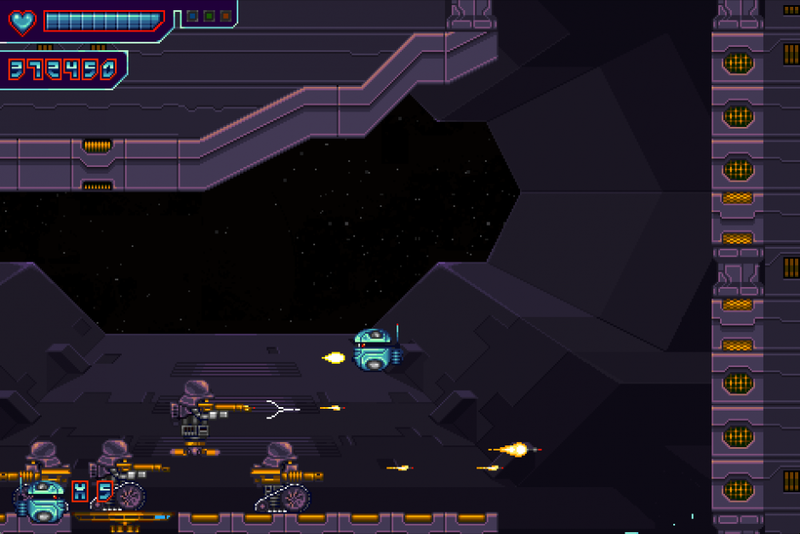 Immediately drawn in by the stylish and vibrant pixel art on the screenshots (not to mention the fact that it promised to deliver the exciting experience of playing as an interstellar robot debt-collector), I impulse-purchased both phone and PC versions. My retro-senses were obviously on top form, as this has proved to have been a great decision. In short, RobotRiot is a wonderfully nostalgic experience harking back to the golden era of video games. It's simple platformer/shmup formula doesn't try to be at all innovative - instead, Retromite have clearly focused their efforts on delivering a solid blast from the past, with a game that could be easily mistaken for a lost early-nineties Amiga classic from Renegade, Graftgold or The Bitmap Brothers. This, as you may have guessed from this so-far gushing review, is a very good thing - at least from the perspective of us retro fanboys at RGCD. Of course, originality is great - if not absolutely essential for the indie scene, but when it seems that everyone is focusing on delivering something 'new', it's a nice change of pace to pick up a well-designed game that you immediately feel at home with and know what to expect. Playing as what appears to be V.I.N.CENT's evil twin, in RobotRiot you're tasked with raiding and disabling a series of increasingly well-defended spacecraft whose owners have been shirking from their debt-paying responsibilities. You know the drill - beam on board, blast everything with extreme prejudice and shut down the reactors on each section of the ship so that they can be towed away and sold off. And that is pretty much it. 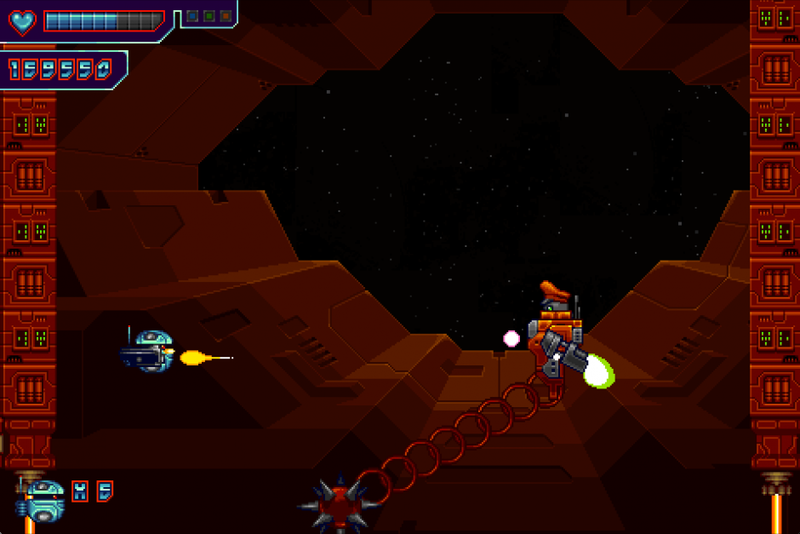 Each craft is varied in appearance and style with an admirable attention to detail to get that classic retro-feel spot on, with multi-layer parallax scrolling, messages that pop up as you pass computer terminals, power-ups, destructible scenery containing collectables and - most importantly - a fixed, single resolution used for all the artwork, including the HUD. Sure, aside from blasting crew members, avoiding hazards and tricky platform jumping sequences there's a few puzzles thrown in the mix, but these are mostly limited to switch-shooting and keycard collection. Likewise, the well-designed yet familiar boss battles are pretty much what you'd expect from a game of this genre. 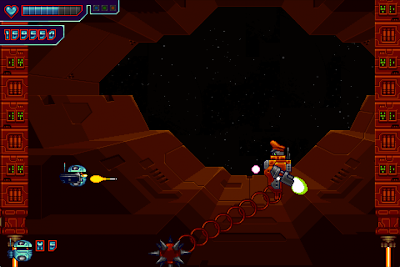 Despite the game's short length (21 levels of varying length) RobotRiot still delivers a fair challenge, and although the use of regular, well-positioned checkpoints means that you'll rarely be in a situation where you get stuck for too long, I'm really glad that Retromite decided to return to the classic limited lives formula - a game like this would be ruined by unlimited continues. However, there are a few (very minor) gripes that prevent the game from receiving the five star recommendation that it otherwise deserves. 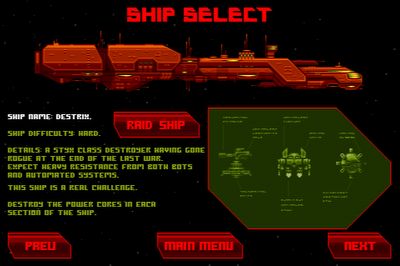 Most critical is the lack of options; there's no joypad support on the PC version (despite there being an XBLIG build!) 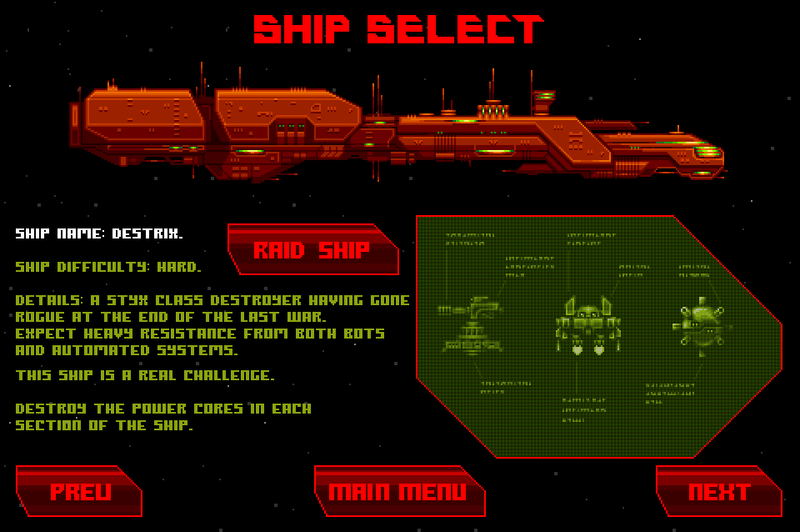 and the weird combination of mouse for menus, keys for game control ruins the illusion of playing a classic retro game. Also, and I know it's just a petty issue, but there really should be an option to alter the volume of sound and music, not just switches to turn them on or off - I'd like the ability to adjust the levels to my taste. Throughout the game, as you complete each ship you're informed that payment has been wired to your account in a neat little cutscene - this was an area that I'd like to have seen expanded upon, as it left me wishing for a shop or somewhere to upgrade my droid using my ill-gotten wealth. However, in the context of such a short game, I understand that this would most likely introduce balancing issues. And aside of being left with the overall feeling of wanting more, that's about all I can muster in terms of complaints. With regard to the tested versions (PC and iPhone) in comparison to the PC build, the iOS port with its touch-screen control is a lot more difficult to play, but it's hard to see how this could be improved upon (and I'm not 100% sure if it supports the iCade). In conculsion, Retromite's debut budget-priced commercial release receives RGCD's seal of approval - it might not be a game for everyone, but for those of you craving a 'new' genuine retro gaming experience, you could do a lot worse than RobotRiot. I am eagerly anticipating future releases from this new development team. (Note that an interview RGCD conducted with Retromite after this review was written can be found here). Buy the PC/Mac version here (from the Desura website). Download the demo/buy the XBOX version here (from the XBOX Games Marketplace). Download the demo/buy the iOS version here (from the iTunes website). I'd love to hear what you think off it mate!